Had the opportunity to catch up with Bruce Gras ’68 in Washington, DC recently. As with all my flying buddies, it takes 1.67 nano-seconds and we’re good to go. Bruce despite some health challenges, continues life at a frantic pace. 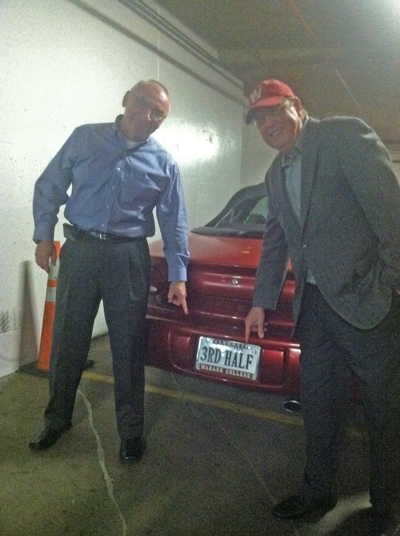 You’ll notice he cruises the DC area is a restored red convertible with a Wabash College license plate. The “3RD HALF” notes a book he’s currently writing. Oh yes, and he has a couple of full time day jobs as well. Did we talk with our hands and shoot our watches off? Of course…all in the name of Wabash. A good time with a good friend catching up…reunions are good! 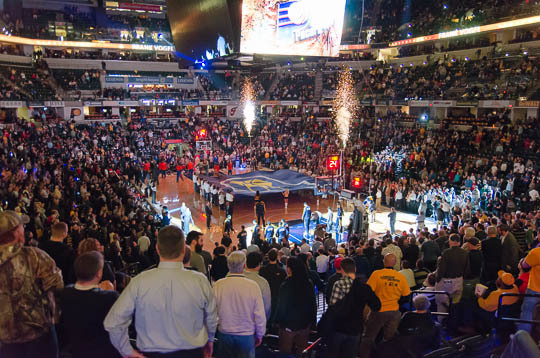 Last week nearly 100 alumni and students gathered for a networking dinner before a Pacers game. The dinner was a great opportunity for alumni of all ages (yes, I was there with my Geritol!) to talk careers with our students. 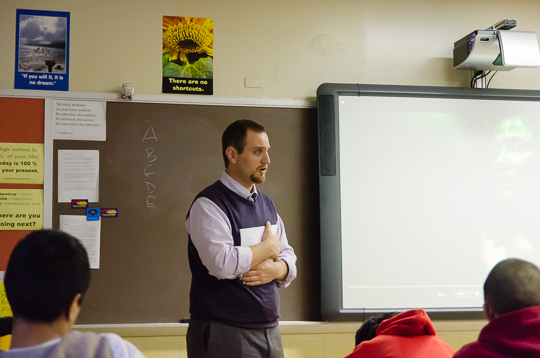 Chris Denari ’83, the voice of the Indiana Pacers, stopped by to quickly tell his Wabash story. It’s one of those “Want something? Go for it!” stories we can all appreciate. After the dinner, the effort carried on during the game. Good stuff – great turnout! The rank amateur photog in me liked the opening show…as you can tell. I want to be one of these guys! They’re super cool! Wabash has started recruiting young men earlier and earlier. We’ve found that 1/3 of the college bound juniors have identified their #1 choice for college…before they even begin their senior year. If you haven’t recruited that junior fully by then, you are fighting an uphill battle. 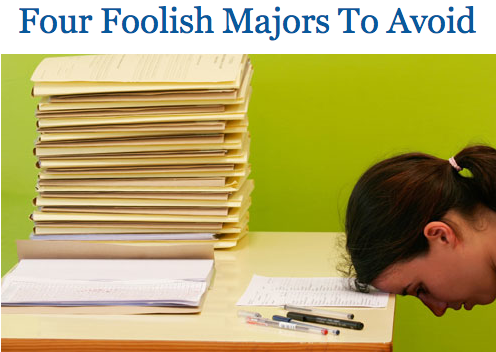 And with fewer and fewer young men going to college…you know the rest. So, here’s a unique avenue – let them join the pledges for an event. You can see this young man fits right in as the pledges “encourage” an opponent at the free throw line. He “gets it.” Know a young man who should be a Wabash man? Click here, my friend! Tell them the Grunge sent you. 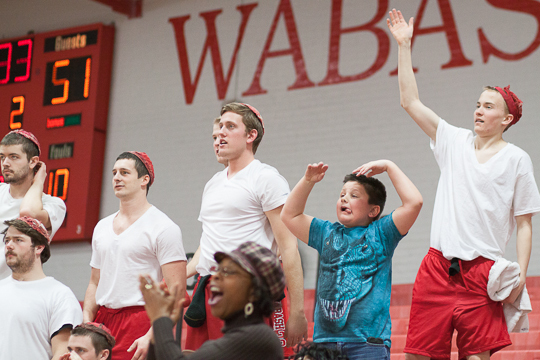 Virtually every Wabash basketball game includes a performance by the students at Dance by Deborah, a Crawfordsville dance studio. This is a chance for their young men and women to be center stage. Our fans are always appreciative and give them great support and applause. 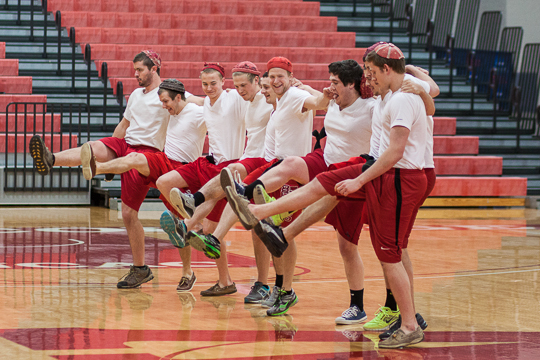 Of course, they are often followed by our in-house dance team, the Sphinx Club Pledges. These guys usually take dancing to an entirely new level. As you can see, they enjoy themselves…and their confidence sure gets a boost. 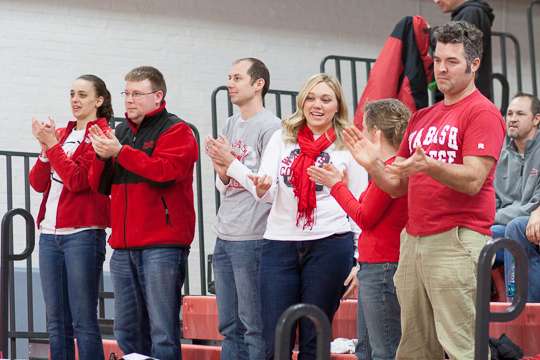 Took this at Saturday’s basketball game against Oberlin. 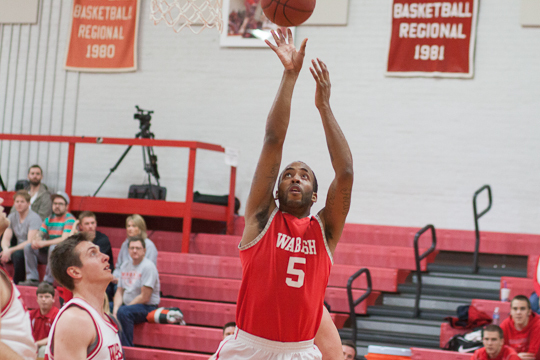 An NCAC playoff spot on the line for both Wabash and Oberlin. But both have not had the kind of seasons they hoped. Saturday afternoon…a lot of other places to be. Great young folks…they get “it” and they enjoy being a part of it. 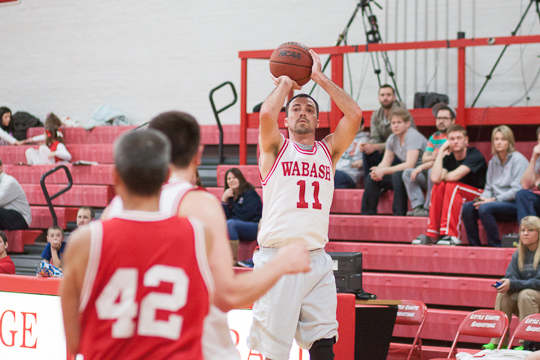 Took this photo at a recent Wabash home basketball game. 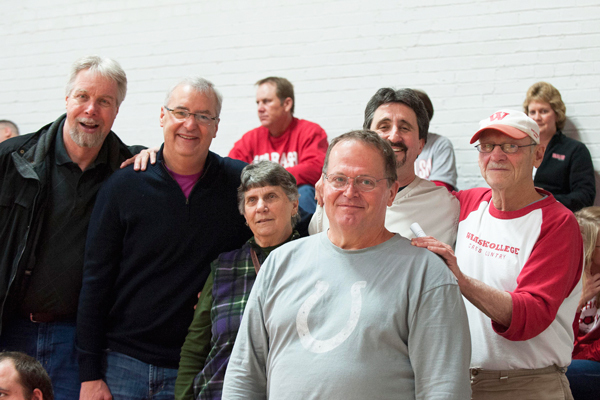 From Left to right: John Clough ’79, Tom Modrowski ’78, Janet Clements, Paul Schepers ’78, Chick Clements H’77, and in front Rick Wheeler ’78. Mini-reunion time. Rick’s local and Paul came from Kansas City, KS! They all had a great time. I hope to see them at the Big Bash. 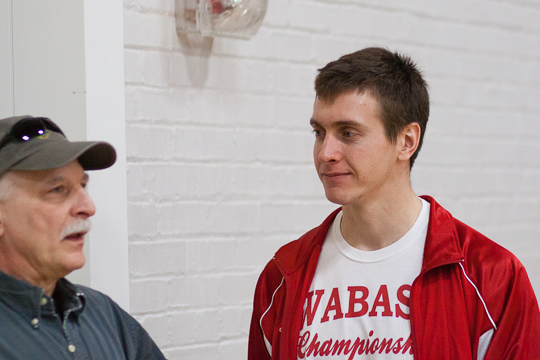 Fond memories – Wabash and brotherhood – bonds that more than stand the test of time. Everyone has seen the PGA commercials where someone says “These guys are good!” after you’ve watched several great golf shots. I felt exactly the same way at the Alumni Basketball game last Saturday. 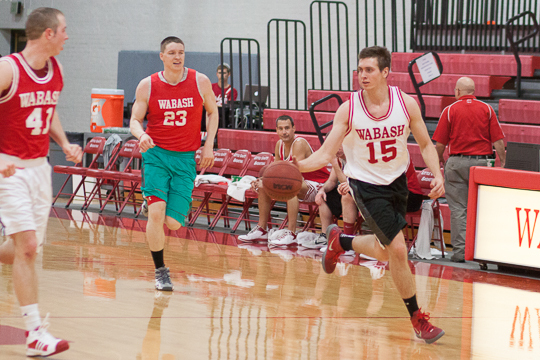 At one point in the game Wabash star Josh Estelle ’00 was guarding Wabash star Wes Smith ’12. Friendly game? It was….right up until the whistle blew…then it was game on! 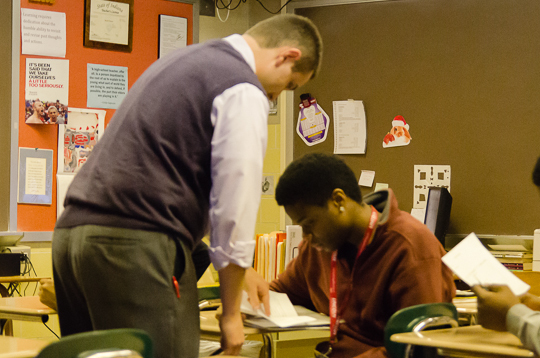 Jeff Dickison ’85 was the senior partner…but you could not tell it. Jeff brough the game, as did Paul Harper ’94 and Mike Crnkovich ’93. Sharp shooting? Absolutely. Josh, Wes, Paul, Chase Haltom 10′, and Brady Claxton ’03 brought it. Inside/outside game? Sure – Jeff, Derek Bailey ’12, Joe DesJean’03, Mark Turpin ’09, Billy Powers ’12, and Rick Strasser ’02 all still had an “A” game. Power inside game? Mike, Andrew Zimmer ’08, Ben Burkett ’11, and Brian Maloney ’09 haven’t lost a step. Best no-calls in the business? Jon Pactor ’71 and his son Jacob ’04. It seemed entirely appropriate that the game ended in a 66-66 tie. Everybody won! For photos from the game, click here. Mark was an Art major at Wabash. He caught up with Prof. Doug Calisch at one point during the varsity game. It was clear to me that Doug and Mark enjoyed a great friendship. Of course, you’ll tell me that’s a great part of Wabash and I’d agree. The wrinkle is this – Mark’s in his third year of Medical school with residency to follow. Varsity basketball…active in student life…Art major…Doctor. Something To Get Your Heart Rate Up This Fine Monday Morning! My friend, James Durham ’64, sent this link to me last week. I was trying to think of a place and time to mention it to generate the right level of…ahh…”constructive discussion”. Heck – it’s a no brainier – a fine Monday morning! I had to laugh at the list as my son, Wabash Class of 1994, can check off the first two!!! And I think he owes a great deal of his present success to the education he received while completing #1 and #2. I traveled to Indianapolis yesterday to talk to some young alumni about a new idea for engaging our students as alumni – before they graduate. We think the concept just might work. I missed talking to Jacob Pactor ’04 at lunch because Jacob’s a teacher at Speedway High School and getting away for lunch is…well…not an option. So I met Jacob at school. I was lucky enough to catch the last 15 minutes of Jacob’s class. In many ways, I was immediately back at Nolan Catholic in Ft Worth, Texas watching a pretty good teacher named…Bill Placher ’70..teach a high school Religion Class. I’ve also seen Jacob’s uncle, Peter Pactor ’65 in the classroom there and he’s exceptional as well. Jacob is good…no great. He has exactly the right DNA to get the best effort possible for young men and women. Peter – you should be so proud!